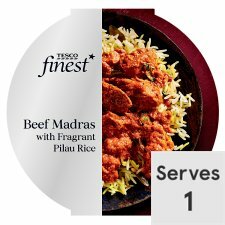 Marinated beef in a tomato and chilli sauce with cooked pilau rice. *Spiced, marinated, slow cooked beef in a rich coconut & curry leaf sauce. Our experts marinate British beef before cooking it for 5 hours, until it's perfectly tender. The rich sauce is made with onions, coconut, curry leaf and tangy tamarind, while the rice is enhanced with a bespoke blend of spices, all tempered to release their aromatic flavours. Cooked Pilau Rice, Beef (23%), Onion, Tomato Purée, Tomato, Coconut Extract, Ginger Purée, Garlic Purée, Green Chilli Purée, Rapeseed Oil, Tomato Paste, Coconut Flakes, Sugar, Desiccated Coconut, Coriander, Cornflour, Salt, Coriander Powder, Turmeric Powder, Tamarind Paste, Cumin Powder, Curry Leaves, Chilli Powder, Caramelised Sugar Syrup, Fennel Seed, Colour (Paprika Extract), Mustard Seed, Black Pepper, Cinnamon Powder, Fennel Powder, Clove Powder. Cooked Pilau Rice contains: Water, Basmati Rice, Rapeseed Oil, Lentils, Turmeric Powder, Curry Leaf, Mustard Seed, Cumin Seed. Remove outer sleeve. Pierce film lid. When removing lid after heating hot steam may escape. Chilled: 190°C/Fan 170°C/Gas 5 30 mins Place on a baking tray in the centre of a pre-heated oven. Stir before serving. Frozen: 190°C/Fan 170°C/Gas 5 50 mins Place on a baking tray in the centre of a pre-heated oven. Stir before serving.